Live life the King�s way with Hotel Samrat, New Delhi! The four star hotel offers great facilities to the guests making the moments spent there a memorable one. The Hotel Samrat is set amidst the busy business district of New Delhi providing easy access to the various important places in the capital city quite easily. The location of the hotel places it 15 km from International Airport, 10 km from Domestic Airport and 9 km from New Delhi Railway Station. The Hotel Samrat in New Delhi reflects the imagery of an elegant stone and marble structure which is carved out around a central flower-filled atrium and open-air courtyard. The stay is accompanied by some of the superb views around the hotel making it one of the favored Four Star Hotels in New Delhi among the Hotels in New Delhi. For a comfortable and luxurious stay the Hotel Samrat, New Delhi offers beautifully designed 247 rooms which are all air-conditioned. The rooms are categorized as 196 twins, 36 doubles, 2 deluxe suites, and 13 apartments; all laced with the best of the luxuries of life. The rooms are attached with bath facilities that are fitted with the most modern amenities. For a sumptuous dining experience the Hotel Samrat, New Delhi offers the experience of 3 restaurants pampering the estate buds of the guests. The guests get the chance to have a taste of Mughlai, Indian, Continental, Chinese and other fares as well. The hotel also offers the facility of a well stocked bar serving to the taste of the guests. For business purpose the hotel offers 3 banquet halls accommodating around 200 people at a time. The halls can also be used for other occasions as reception and various functions. 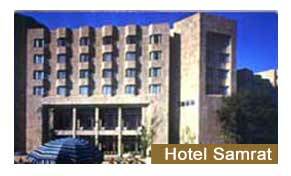 Indiahotelandresort.com offers online information and booking for stay at the Hotel Samrat, New Delhi. For booking, or for more information, please enter your query in the form below.